Today we are going to understand about one of the main features of Spring Framework - Dependency Injection and how to use this feature within a Spring Project using the Eclipse Integrated Development Environment(IDE) application. Dependency Injection is a feature of Spring Framework which allows us inject primitive values as well as an object(bean) value into another object(bean). In dependency injection, a dependency could be a primitive value or an object(bean). An injection is the passing of a such dependency(primitive value or an object) to a dependent object that would use it. To understand this concept of dependency Injection by the setter method, let's proceed with an example. In the upcoming section, we are going to create a few loosely coupled Java classes also known as beans, configure these beans in a configuration xml file, load and instantiate the beans and perform dependency injection using the Spring Framework. We are going to create a java class named OutdoorSport within the decodejava package and this class contains a message info(). Next, we are going to add another Java class named Tennis and it is going to contain a String object and an OutdoorSport reference, hence Tennis class is dependent on OutdoorSport class. These objects of String class and the OutdoorSport class will be injected into a Tennis instance/bean by an automatic call to the setter methods in the Tennis class by the Spring Container, when the Tennis bean is created by it using the configuration xml file(to be created in the upcoming section). Creates the Tennis bean, calls setter methods i.e. setMessage() & setSport(), creates the OutdoorSport bean specified in it and injects it into Tennis bean. Accesses the bean specified in the configuration file by calling the getBean() method of ApplicationContext container. Calls the method of Tennis class - getMessage(). In this file, we have configured a Tennis instance with a unique id and a String object and an OutdoorSport instance is injected into the Tennis bean using the setter methods in Tennis class.. The name child attribute refers to the name of a property in the Tennis class i.e. sport and message. The value child attribute refers to the value of a property in the Tennis class i.e. property message, is automatically assigned a value Let's play Tennis! by calling the setter method - setMessage(), when the bean is created by Spring Container. The ref child attribute refers to the reference name of the property which is matched with the id of another bean(another class - OutdoorSport) declared within a different <bean> tag. The leads to calling of setter method - setSport() by the Spring container. 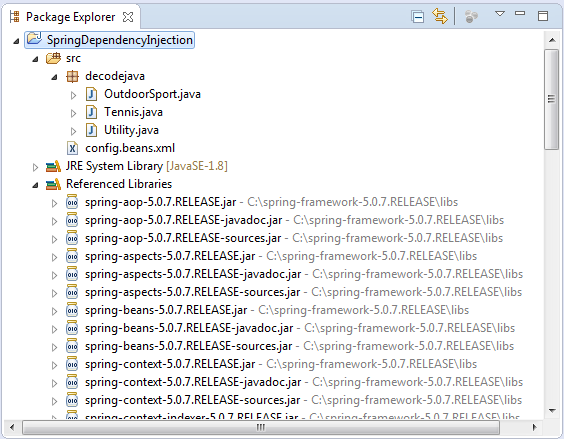 Project Folder - SpringDependencyInjection is the name of our Project and it is a top-level directory. An POJO/Entity class file i.e. OutdootSport.java. A dependent class named Tennis.java class, which contains an object of OutdoorSport class. Finally, after executing Utility class, you will get the following output within the Console window. This output shown below, shows how the Utility class has used the ApplicationContext container of Spring Framework to load the configuration xml file - config.beans.xml, access the beans specified in it, instantiate the Tennis class and OutdoorSport class. It also injects OutdoorSport bean into Tennis bean and calls their methods. This concludes performing the dependency injection by injecting a bean into another bean using the setter methods. In the next article, we are going to show you how to perform the dependency injection using the constructor.